The Challenge Cup is our club competition. It is an ongoing competition that runs for the full length of the year, and is designed to encourage participation throughout the year. All members of the Whitehorse Chevaliers Fencing Club are eligible to participate. To win points, challenge another fencer to a bout during one of the normal club training sessions. Both fencers must agree prior to starting the bout that it will be a challenge cup bout. The bout must have a referee and go to 5 points. Record the result on the Challenge Cup score sheet. That’s really all you need to know to get started! Each challenge cup bout earns both fencers a participation point, regardless of whether you win or loose, and the winner earns victory points. If the winner was initially ranked lower than the other fencer, s/he will also get an additional number of points equal to their separation in the rankings. Eg: the 6th ranked fencer challenges the 3rd ranked fencer to a bout, and wins. The 3rd ranked fencer gets one point added to their total score, the 6th ranked fencer gets 1 + 3 = 4 points added to their total score. There are no restrictions on who you can challenge (as long as they are club members) or how often you compete. At the end of the year it will be a combination of both fencing skill and participation that will determine your final ranking. 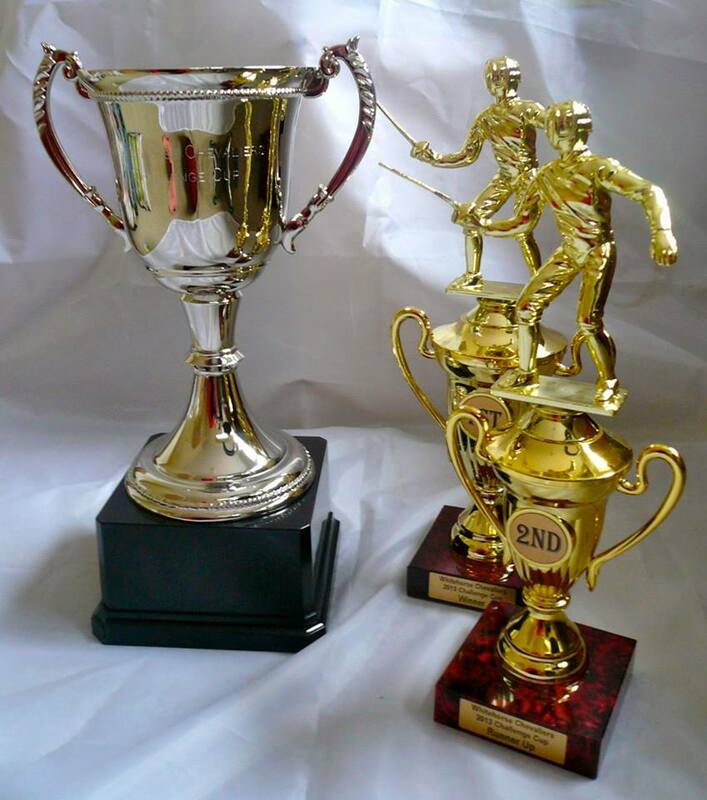 Prizes will be handed out at the clubs annual end-of-year event. All enquiries should be directed to the club President. You can check the current rankings here. 1. The Challenge Cup tournament is open to all current financial members of the Whitehorse Chevaliers Fencing Club. 2. The duration of the competition will be from the first club training session in the calendar year until the week prior to the clubs end of year event, or the final training session for the calendar year, whichever comes first. 3. Competitors may enter the tournament at any time during the year. All competitors enter the tournament with zero points. 4. At the start of competition, all competitors rank equal first on zero points. 5. At the completion of the tournament, the top ranking fencer will have their name and the year engraved on the Challenge Cup trophy, and be awarded any personal prize that may have decided upon. 6. In the event of a tie for first place, the tied fencers must fence off for total victory. In the event of multiple fencers ranked equal first, this may take the form of a ranking pool followed by direct elimination bouts, or other format chosen by the club committee. – Be agreed on by both fencers prior to starting. – Be conducted at regular club training sessions. – Be scored to 5 points. – Be scored by 4 hand judges and a referee, with all 5 officials accepted by both fencers. – Each participating fencer is given 1 point. – Where the victor is the lower ranked fencer, the victor is awarded a number of points equal to the difference between them and the higher ranked fencer. Eg. 6th VS 3rd, 6th wins. 6th gets 1 + (6-3) = 4 points. – Where the victor is the higher ranked fencer the victor is awarded one additional point. – Where the two fencers are of equal rank, the victor receives 1 additional point. Eg. 3rd VS 3rd, Victor gets 1+1= 2 points, defeated gets 1 point. 9. Challenge Cup bouts may be foil, epee or sabre bouts, as agreed by the competing fencers. 10. Participating fencers may withdraw from the tournament at any time. They are removed from the rankings, but points earned by their opponents from prior bouts are retained.